If your combination boiler ("combi" boiler) stops working, it could be because the water pressure is low in your boiler. These are known as a “Pressurised Systems” and if the pressure drops below a certain pressure the boiler will switch off. 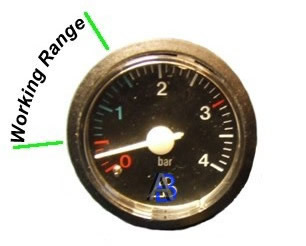 The boiler will have a gauge and will normal be around 1 bar when cold, if you see the picture of the gauge it is marked green for the normal working range (it will increase as heating temp increases) and there is also red line for minimum and maximum pressures, note the pressure is to low in this system (Gauge in red). You will need to use a filling loop to re-pressurize the system (this will allow mains water pressure into the system), this maybe part of the boiler or a flexible pipe (see picture) check with the boiler manufacture if unsure. 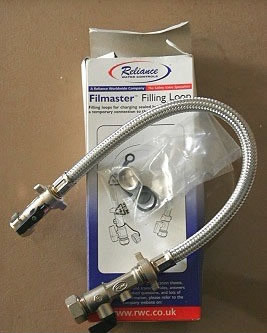 After you have connected the filling loop just open the valve to let the mains water pressure top up the system, slowly open the valve on the filling loop, until the correct pressure is seen on the gauge (normally 1 bar). Very minor leaks can cause pressure drops over a long time, possibly several months or even a year, bleeding a radiator will cause the system lose pressure. Larger leaks may be more visible and leave a stain. Hidden pipe work in solid floors and walls my hard to find. Tip! Check for minor leaks when cold, as expansion can cause minor leaks to seal and the leak also evaporates away.